This multi-layer cake originated in Indonesia during the Dutch colonial era. It is actually based on a European spit-cake. The full Indonesian name of this cake is kue lapis legit. This loosely translates to "sweet layer(ed) cake". Kue, kué, or kueh (pronounced "kway" in English) is the Indonesian and Malay word for cake. The Dutch name of this cake is spekkoek, which has been adopted into the Indonesian language as spekkuk, spekuk, and spiku. The Dutch name translates to "bacon cake", and refers to the alternating light and dark layers - as in a slice of bacon. In Malaysia, it is typically called kek ( = cake) lapis. 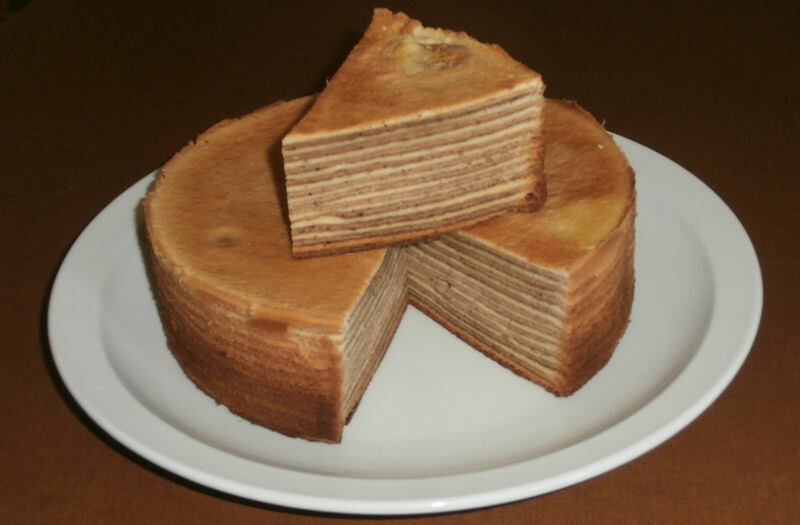 The cake is made with one batter, that is divided in two. One half has spices in it (not unlike gingerbread spices), the other does not. The spiced batter turns dark brown when baked. A common variation is a cake with alternating green and dark brown layers. Here, juice from pandan leaves is added to the batter without spices. The juice is light green (bright, neon green cakes have been colored with food dye). By the way: pandan leaves (from the screw-pine/palm tree) are an excellent cockroach repellent! Bottom line: it is a multi-layer spice cake. A good kue lapis has at least 15-20 layers. 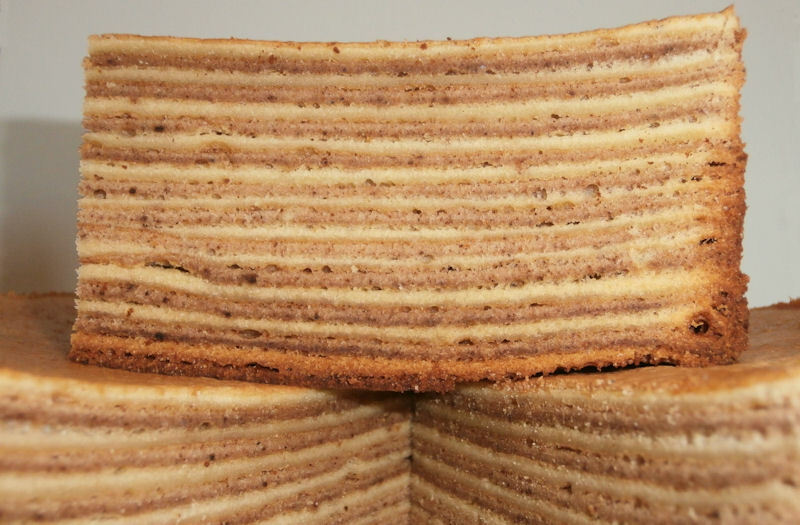 Each layer is baked separately. This is a very time consuming process, which explains the relatively high price of store-bought cakes. Getting consistent layers is not all that simple. The cake is baked in the oven, under the top broiler. The bottom cake layer gets baked throughout the entire baking process, but is farthest from the broiler. Additional layers have progressively less total baking time, but are progressively closer to the broiler... You may have to discard the bottom layer. Best when made a day ahead. Keeps for 4-6 weeks in a refrigerator (1-2 weeks unrefrigerated). Weigh your (very) large bowls when empty, and write down the empty weights - this will make it easier to split the batter into two equal amounts. Put the flour into a large bowl, and whisk to loosen it up and get all lumps out (if any). Using a whisk is a lot easier and faster than a sifter or a sieve. Sometimes you get a foul egg, or the yoke breaks when you crack the egg. You do not want to get any yoke in with the egg whites! Use a separate cup to crack the eggs - let the white drop into the cup and transfer the yolk (if good) to the bowl with yolks. One in a while, empty the cup with whites into the bowl with whites. This way, you will never ruin more than one egg white (or a couple). While stirring, mix in the flour. Beat for 1-2 minutes. If you want to be precise, weigh the very large bowl with all the batter in it, then subtract the weight that you measured when that bowl was empty, and divide the resulting number by two. 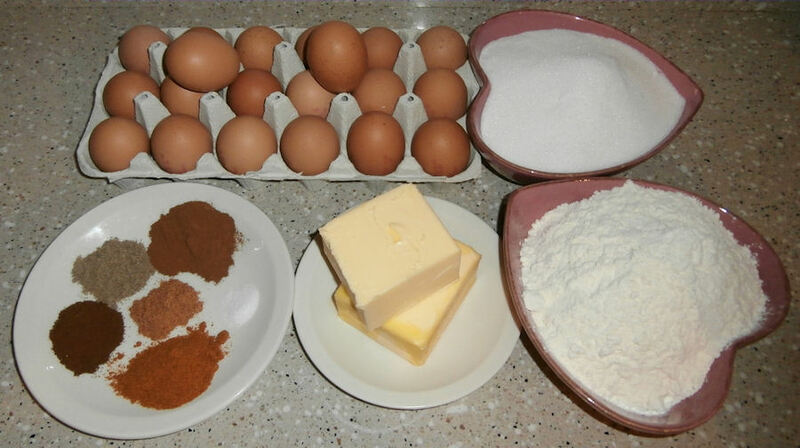 That is the weight of the batter that must to be transferred to the second bowl. Put the second bowl on the scale, zero the indicated weight, then transfer batter until the indicated weight equals the amount to be transferred. Bake in the oven for 3-4 minutes. The layer of batter should be almost dry. You will have to get a feel for this, as it depends on your oven, etc. With the other measuring cup or ladle, scoop batter with spices into the pan, and completely spread with the second spoon. Bake in the oven for 3-4 minutes. The layer of batter should be almost dry. After a total of 8-10 layers (with and without spices), you may have to increase baking time to 5-6 minutes. again, this depends on your oven, etc. Remove the cake from the pan, and wrap in plastic kitchen film. You can also cut the cake up in 8 or 10 wedges, and then wrap them in plastic film. Obviously, making this cake takes a lot of work! The first time I made one, I used a 20 cm (8 inch) springform pan, and had batter left over. By that time, it was after 1 o'clock in the morning, and I did not feel like baking another 20 layers in one of my small (10 cm / 4 inch) springform pans. Instead, I put half of the batter without spices into the small pan. Then spooned the batter with spices in circles over the plain batter. I covered it with the rest of the plain batter. I then gently swirled a table knife throughout the batter, and baked the cake at 150 °C (300 °F) for about 40 minutes (I think...) - until a toothpick stuck into the center came out clean. The result was a nice marble-cake, that basically tasted the same as the layered cake!